The weather is finally cooperating and we are having very nice mild temperatures. I love 80 degrees. Not to hot and not to cold. Just perfect like Hawaii. The Fern Grotto is back in Summer Place. Dressed in style. the begonias in the bathroom didn't work out so well and now they are living in the Fern Grotto. See post about Begonias in the Bathroom go HERE. The Vintage Bird cage I won has been moved outside. And just behind the Asparagus fern is a birds' nest. and... MOTHER WAS WATCHING ME! A new Boston Fern was added next to the pots and another spider plant is in the pot below. The water drips down the Boston Fern into the spider plant. The tree fern isn't doing so well. I took a few photos today of my new angel. She was a Birthday gift from my son and family. I decided to move some of the pots around and take my vintage bird cage into the house. I love this wooden bird cage I found at the thrift store. The birdies are still there. They are growing up. My Geranium did well over the winter too. I bought the little table for a dollar at a yard sale and painted it black. If it gets ruined from the weather or water it's no great loss. But, now that I look at it ... I think I will put a tray under it I can see the water will run down the pot and on to the table. Sweetheart has put a drip system in the Fern Grotto, and every afternoon at four o'clock each pot is watered for about five minutes. I love to look at the photos. I can see so much more I can do to make the space look more interesting. Maybe I'll move the geranium on the bricks next to the little boot. When the birds leave the nest I will move the wooden bird cage back a little more. I just didn't want to make MOTHER BIRD to angry. You know I love to share with you what's going on around here at My Cozy Corner. Wow, your ferns are beautiful. You must have the green thumb, all your plants are beautiful. The bird picked a happy place to nest. Lovely photos. That's a beautiful wooden birdcage. It really sets everything off. And I love the name 'Fern Grotto' for this special area. Very charming. I hope the little birdies do well in their fern sanctuary. Have a great day. Happy belated birthday to you! Your fern grotto is very impressive! Love everything on it and surrounding it. I do the same thing with pictures and get new ideas. My birtday is in May and my family knows I'd like plants or garden ornaments! Happy June to you! Oh this looks so cool and peaceful! A very happy belated birthday to you. Have a wonderful year! Very nice. I really like all your little angels. I'm your 300th follower! So relaxing and lovely to look at too! What a lovely spot to relax. You have a delightfully cozy space there! It is indeed a lovely cosy little corner. Your ferns are great and that Spider Plant and new Coleus plants look terrific as well. Love the bird cage! Your angels fill the space nicely. You have created a very nice place for your angels to rest. It must be fate that I found your blog. Your fern grotto is gorgeous! You must be the person to ask a fern question to. I recently had my petunias die out and wanted to put in ferns. The location gets sun from sunrise to about 3 pm. Is this a good idea? Hi Betty, I love your patio. What a gorgeous and serene plaxe to sit and read a book! 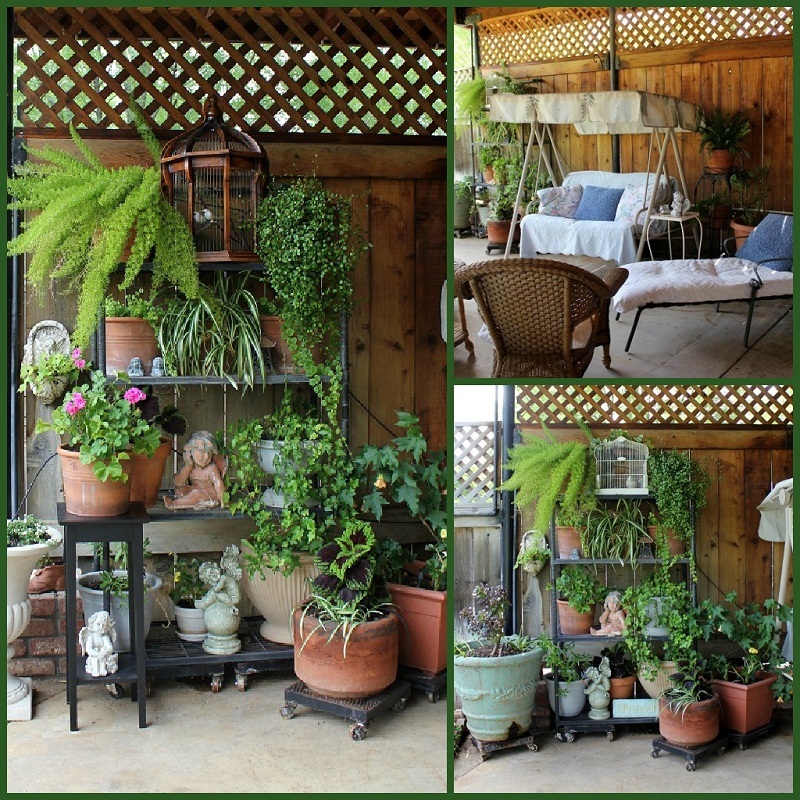 There is nothing like a fern to make an outdoor space inviting. Your fern grotto makes such a pretty outdoor space!